Tajweed Quran - Shoba from Asem Narration. 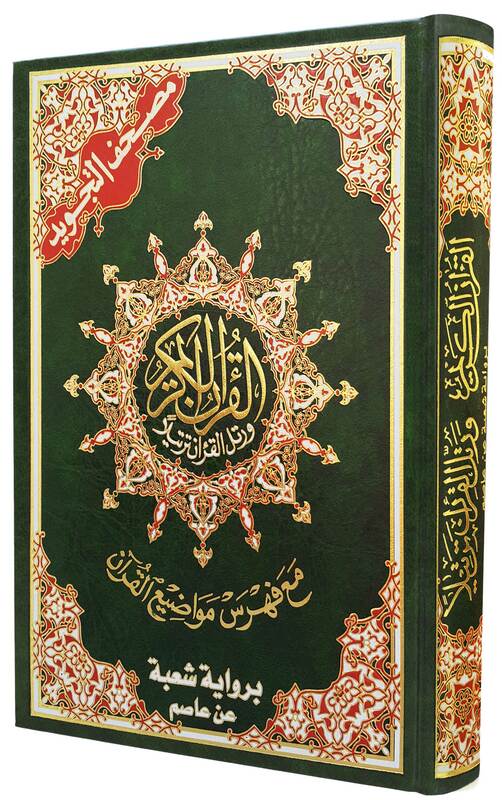 Size: 7"x9"
This Tajweed Quran is in Shoba from Asem narration. Color coded Mushafs completely changed my Quran recitation experience. Now it is much easier to recite due to added space between words, and with color-coding I am constantly reminded to appropriately apply every of the Tajweed rules during recitation, which is of great importance. I would also recommend this Color Coded Mushaf for everyone memorizing the Quran, because of double benefit of the color-coding: first it helps you memorize correctly with all the Tajweed rules, and second the colored letters attract attention of your eyes, making it much easier to memorize. May Allah Subhaanahu we Teala reward Dar Al-Maarifah for making it easier for us to recite the Holy Quran.